The advent of e-commerce has forced a change in mindset for many industries. Converting is no exception. Gary Evans, vice president and general manager of Edson Packaging Machinery (Edson) said, “Although most changes have been evolutionary, the changes in e-commerce could force revolutionary changes. We (the entire supply chain) need to change our mindset. I’d love to be able to sell a machine to Amazon that would serve its needs.” Edson, a ProMach product brand, is a manufacturer of high speed case packing equipment to the tissue industry for more than 55 years. Helping Edson along with this possibility is one of its newest ventures, a partnership with Green Ox Pallet Technology (Green Ox), but more about that later. Edson was founded in 1962 by the late Ed McCrudden, a “true entrepreneur,” according to Evans. He actually started the company out of his garage and held the patent for the first automatic case packing machine. Since the beginning, tissue has been the focus of the company’s efforts and accounts for approximately 90 percent of its revenue. Through the years, the company succeeded in establishing long-term relationships with what Evans calls the blue chip companies representing tier 1 tissue converters. “We have re-invented ourselves several times over with new machines and technologies” Evans says. Edson has a global presence—South America, Australia, Mid-East—but most of its business is in North America. In the tissue industry, it works with both independent converters and integrated firms. No matter the customer, a supportive supplier: client relationship is becoming more important. “It goes above and beyond technology,” Evans points out. “The strength of support throughout a relationship is bigger than technology. The ability to address the needs of its clients is critical to any success Edson may achieve. There are different levels of support that customers need. Evans explains that the smaller players often need more on-site support. “More often than not, blue chip companies have their own support staff. We provide ongoing training as needed. 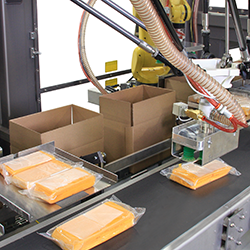 IO-Link is a new sensor and actuator standard that can improve flexibility, capability, and productivity of new and existing packaging machines. It is based on the first international standard for IO technology and has the support of the major automation companies from sensor and actuator producers to controls suppliers. As can be expected, Edson has a wide range of possibilities available to fit customer needs. At Tissue World 2016 in New Orleans, it introduced the Raptor SL, an automated case packer aimed at small to mid-sized companies serving both the at home and away from home (AfH) markets. 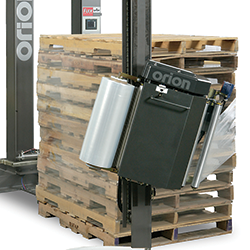 The Raptor SL is a side load case packer that erects, packs, and hot-melt seals up to 12 cases per minute of bath, facial, towel tissue or napkins. Edson also produces a 1000 Series, “a basic, air-powered semi-automatic packing machine.” Evans says this has more manual operation than its high-end models. It is a value-based packing machine designed for companies looking to automate their production. At the high end, the high-speed 3600 Series offers fully automatic operation with lots of range and built-in flexibility. Cascades’ new converting facility at Scappoose, OR, featured elsewhere in this issue, installed the Edson 3600 case packer. Although Edson serves mostly high-end range with large volumes (26-27 cases per minute depending on the product), Evans adds that the company is trying to reach lower volume producers as well. He says that Edson does customize its products based on customer needs. “Our focus is to provide the best solution for customers. 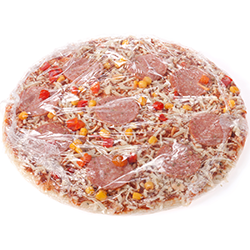 Our machines have different variations to serve different products, configurations or size of container.” A wide range of flexibility is critical because of the different products that could go through the packing machine. An example of this can be seen in the robotic top load RPd 270 case packer. 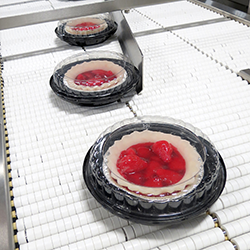 Evans says the company “leaned on” the technology of the 3600 and transformed it into a separate machine because some customers only use trays. As mentioned, Edson’s latest venture is with Green Ox to develop a corrugated pallet assembly machine. When Tissue360° visited Edson, a prototype was close to completion. The 700-square-foot machine will feature up to four stations and can assemble 200-250 corrugated paper pallets per hour, providing just-in-time pallet production for end-of-line real time pallet availability. Evans adds the venture makes good sense for Edson because of its 55 years of experience with end of line packaging. “We understand corrugating and product control, so going from a case packer to Green OX is in line with what we do and how we can leverage our experience in the market, our engineering know-how and financial strength." The cooperation dates back to the Tissue World conference where Green Ox proposed a project. “They were looking for an innovative manufacturing process with innovation at its strength,” notes Evans. “That’s our whole value offering. Compared with wood, the light weight corrugate will reduce transportation costs due to fuel savings. However, he is quick to point out the end solution is not to eliminate wood pallets. A standard 48x40 corrugated pallet weighs less ~10.5 pounds and can hold up to 2,300 pounds. Mixed case lots are a possibility, according to Evans. “This lends itself to e-commerce and shows the flexibility of the technology. If you order from home and want tissue products, what if you could get them in one delivery. Give me what I want when I want it.